The free movement of goods is one of the four fundamental freedoms of the Single Market. The Single Market in goods encourages innovation in product markets while contributing to more opportunities for businesses and allowing more choice for consumers across Europe. The free movement of goods does not necessarily mean that every product must be identical in every corner of the Single Market. Whilst consumers are free to buy the products of their choice, business operators are also free to market and sell goods with different composition or characteristics, provided that they fully respect EU legislation (whether on the safety of products, labelling or other horizontal or sectoral legislation). In order to remain successful, businesses must continuously adapt and innovate their products, responding to different trends in demand, logistical issues and emerging technologies. Even products under the same brand may have different characteristics, due to legitimate factors such as the place of manufacture or consumer preferences in the destination regions. However, what can be a source of concern is when different compositions of identically branded goods are marketed in a way that has the potential to mislead the consumer. The EU has developed a comprehensive legislative framework to safeguard consumer rights. Effective consumer protection is essential for an efficient and well-functioning market. This framework includes the protection of consumers against misleading information and commercial practices. The issue of dual quality of certain products (1), and in particular food products, has been a source of growing concern. In March 2017, the European Council welcomed action by the Commission to take the issue further. As clearly underlined by President Juncker in his State of the Union address (2), there cannot be second-class consumers in a Union of equals and it cannot be acceptable that ‘in some parts of Europe, people are sold food of lower quality than in other countries, despite the packaging and branding being identical’. The Commission is taking forward action on various fronts with a view to restore citizens' confidence and trust in the Single Market, and has decided to focus in the first instance on the area of food. This action combines dialogue with the parties concerned and practical steps to enable concrete measures to be taken by the responsible authorities. Following the discussion at the European Council in March 2017, the Commission brought the issue to the High Level Forum for a better functioning food supply chain, to engage a dialogue between the industry, consumers and national authorities. This dialogue will continue in the coming months. In addition, the Commission has been working on concrete measures to ensure reliable and comparable evidence, starting in the area of food. The Joint Research Centre is working on guidelines for a common testing methodology, as a step towards comparable and authoritative tests across the EU. This is essential to assess the magnitude of the issue, and to provide the sound evidence basis required for action to be taken. Another step towards clarity and transparency would be to improve information on the exact content of a product. In the area of food, the Commission is discussing with business, in particular food manufacturers and retailers, how to ensure full transparency in product composition (beyond the current legal obligations). One option being explored is a Code of Conduct for producers, to set out standards to be respected to prevent dual quality problems. Last, the Commission has been looking at enforcement of relevant EU legislation together with national consumer protection and food authorities. the ‘Unfair Commercial Practices Directive’ (6), which ensures that consumers are not misled or exposed to aggressive marketing and that any claim made by traders in the EU is clear, accurate and substantiated. It seeks to enable consumers to make informed and meaningful choices. This horizontal Directive applies to many commercial practices which are also regulated by other general or sector-specific EU legislation, such as food, toys, cosmetics, detergents and others, but only for those aspects which are not covered by sector legislation. It is the role of Member States, and in particular national consumer and food authorities, to ensure compliance with the EU consumer acquis and enforce the European safety and food labelling legislation at national level. However, the Commission is committed to assist national authorities by providing the necessary support and guidance. This Notice clarifies the relevant legislative framework in order to provide national authorities with tools and indicators to ensure proper enforcement. It should be seen as a first step in the Commission action to support national enforcement authorities in their efforts to put an end to unfair practices. It may be further updated in light of new evidence based on the common testing methodology, and regarding products other than food. Pursuant to the requirement in Article 8 of Regulation (EC) No 178/2002 on general principles and requirements of food law, whereby food law aims at the prevention of practices misleading consumers, Regulation (EU) No 1169/2011 on the provision of food information to consumers (the Food Information Regulation) puts in place a comprehensive legal framework aimed at ensuring not only a high level of protection of health of consumers and their social and economic interests, but also the free movement of safe and wholesome food in the EU Single Market. by suggesting by means of the appearance, the description or pictorial representations, the presence of a particular food or an ingredient, while in reality a component naturally present or an ingredient normally used in that food has been substituted with a different component or a different ingredient. That Regulation also establishes a list of mandatory information which should in principle be provided for all foods: in particular, the name of the food, the list of ingredients, the quantity of certain ingredients or categories of ingredients, allergen information, a nutrition declaration, etc. Food information must be clear, accurate, and easy to understand for the consumer. For that purpose, the Regulation lays down specific requirements for presentation of mandatory information, including minimum font size. The Commission services have worked extensively with the competent authorities of Member States to foster a common understanding of and facilitate the application of the rules of the Food Information Regulation and are currently fine tuning a notice to be soon adopted by the Commission. A specific guidance as regards information on substances or products causing allergies or intolerances was issued by way of Commission Notice C(2017) 4864 final of 13 July 2017. For competent enforcement authorities, checking the respect of the Food Information Regulation should therefore be the first step in an investigation of the compliant marketing of food products. By virtue of the lex specialis principle enshrined in Article 3(4) of the UCPD, in case of conflict or overlap between the UCPD and sector-specific provisions of EU law which regulate specific aspects of unfair commercial practices, the sector-specific rules prevail and apply to those specific aspects (7). Nonetheless, the UCPD will continue to remain relevant to assess other possible aspects of the commercial practice which are not covered by the sector-specific provisions. Thus, the UCPD can usually be applied together with sector-specific EU rules in a complementary manner. Since Article 11 of the UCPD requires all Member States to ensure that adequate and effective means exist to combat unfair commercial practices, in those Member States where different authorities are responsible for enforcing the UCPD and the relevant sector-specific legislation, the authorities should co-operate closely to ensure that the findings of their respective investigations into the same trader and/or commercial practice are consistent (8). It is also important to stress that information required by sector-specific EU law in relation to commercial communications, including advertising and marketing, is considered “material” under the UCPD (9). Material information refers to key pieces of information that business operators are required to provide to consumers to enable the latter to take informed transactional decisions (10). Failing to provide such material information can qualify as a misleading commercial practice if the omission can be considered likely to cause the average consumer to take a transactional decision he or she would not have taken otherwise. For example, the Food Information Regulation requires business operators to provide specific information about products such as the quantity of certain ingredients or categories of ingredients. This is “material” information within the meaning of Article 7(5) UCPD. The omission of this information could be, after a case-by-case assessment, considered misleading to the extent that it is likely to affect the transactional decisions of the average consumer. 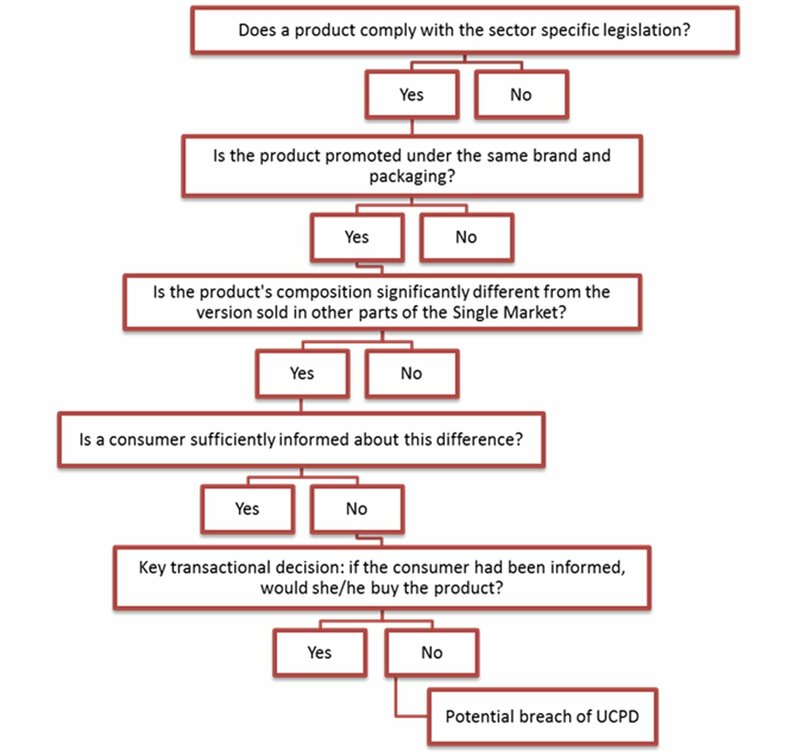 The UCPD operates as a safety net ensuring that a high, common level of consumer protection can be maintained in all sectors, complementing and filling gaps in other EU laws. The UCPD prohibits any commercial practice if it contains false information or if, in any way, it deceives or is likely to deceive the average consumer, even if the information is factually correct, in relation to the main characteristics of the product and, in either case, cause or is likely to cause him/her to take a transactional decision that he/she would not have taken otherwise. Assessing whether a commercial practice is in breach of the UCPD requires a case-by-case assessment. this inadequate or insufficient information is likely to distort the economic behaviour of the average consumer, for instance by leading him or her to buy a product he or she would not have bought otherwise. consumers' perception of the main characteristics of the product corresponds to the composition of that product such as advertised in the majority of those Member States. The work currently carried out by the Joint Research Centre will provide more indicators to refine food comparative tests. whether the missing or unclear information on the main characteristics are likely to alter the average consumer's transactional decision. The existence of one or several branded products in the general offer of a certain category of processed food products (e.g. coffees, chocolates, teas, sodas, etc.) influences most consumers when making their choice. The transactional decision of a consumer for a branded product is in large part based on his/her perception of what this brand represents for him/her. Concerning foods, this is a subjective opinion formed through the sensory experience of each consumer, its dietary preferences and through factors such as exposure to brand advertising and image building efforts. The average consumer may not purchase a branded product if he or she has reasons to believe that the product purchased deviates from his or her perception of what the branded product should be like. The difficulty of assessing the presence of possibly deceptive elements in communication about branded products lies in the fact that the perceived ‘branded’ characteristics of a given product are not translated into an objective explicit, measurable description by brand-makers. They are suggested to consumers by various inexplicit communication means and/or generic assertions about the good being conform to its trademark or what made its success over time. For example, texts such as ‘original’, ‘unique’, ‘the founder's recipe’, ‘no matter where you go, you will have always the same eating/drinking pleasure’, are frequent on food packages. Studies made on brand loyalty demonstrate that brands act in the mind of consumers as a certificate for a controlled and constant quality. This explains why some consumers may expect branded products to be of equivalent quality if not exactly the same (12) wherever and whenever purchased and brand owners to inform them when they decide to change any important element of the composition of their products. It should also be recalled that in the Single Market where consumers have a general understanding that this is the market in which they purchase and where the free circulation of goods and equal access to goods is ensured, consumers do not, a priori, expect branded products sold in different countries to be differentiated. However, for food and drink operators, a ‘constant quality’ does not necessarily mean identical products across the different geographical areas. Indeed, it is common for food business operators to tailor their products to local consumer preferences and other conditions. In particular, sensory optimisations are performed to fit dietary habits that may be very different from one region to another. Furthermore, there may be objective differences in sourcing, due to the geographical and/or seasonal availability of raw materials (or specific local requirements), that have an effect on the composition and/or taste of products and that are therefore difficult to avoid for producers. There may also be the introduction of new recipes to reflect technological progress or nutritional reformulation policies, which cannot technically or economically be done simultaneously in all markets. Finally, food business operators may also adapt the composition of products to the price elasticity of local demand. Insufficient information on differentiation of products marketed in different Member States under the same brand may influence consumers' transactional decisions. After checking compliance with EU food law, when enforcement authorities have specific information which lead them to conclude, after a case-by-case analysis, that differentiation practices of a particular food business operator might amount to unfair commercial practices, they might consider performing market tests that involve product comparisons across different regions and countries. Such tests should be carried out with a common testing approach on which the Commission is currently working. The outcome of this work might provide further evidence and recommendations to the issue at stake. but have significant differences in composition and/or sensory profile. The presentation of a product, or its advertising, that would induce consumers to believe the product is the same everywhere in the Single Market, such as stressing its uniqueness, its origin of first production, its originality, its traditional unique way of production or recipe, its conformity to a recipe created many years ago in a specific place, etc. Marketing strategies of various versions of a product which are potentially confusing for consumers. For example in its distribution strategy, a business operator which distributes different quality grades across the Single Market, sells only lower grades in certain regions/countries without enough information to allow consumers to understand which grade is available in their local market. Lack or insufficient information to consumers (via any means of public communication) about the fact that elements of the composition of products have been significantly changed compared to the past (e.g. introduction of a new recipe) – while considering changes of composition as such, in the context of nutritional reformulation policies of Member States, as in line with the requirement of professional diligence. While the assessment of what are ‘significant’ differences may change based on the facts and circumstances of each case, a significant difference in the main characteristics of a product can generally be found when: (i) one or a number of key ingredient(s) or their percentage in a product differs substantially as compared to the ‘product of reference’; (ii) this variation has the potential to alter the economic behaviour of the average consumer who would take a different purchasing decision if he/she were made aware of such difference. For each food-product, a preliminary check should be done of all requirements laid down under the Food Information Regulation. For food products to which standards on their composition apply, compliance with the legal requirements of the applicable Regulations should also be checked (14). If any of the information required under the above Regulations is either missing or presented in a misleading manner, the authorities should take the necessary enforcement measures. As this issue concerns practices of business operators across the Single Market and involves a cross border dimension, competent authorities should seek to conduct the above mentioned investigation, when this is appropriate, in a coordinated manner, under the Consumer Protection Cooperation (CPC) Regulation (EC) No 2006/2004 (15). The CPC Regulation establishes clear mutual assistance obligations between competent authorities to make sure that the authorities of the Member State where the trader is established take the necessary measures to cease infringements which affect consumers in other jurisdictions of the Union. The Regulation also sets out the obligation for authorities across the EU to alert each other about possible infringements and to exchange information about such infringements. In case of misleading information on the characteristics of a food product, the CPC authorities of the country where consumers may be harmed, should make full use of the tools provided by the CPC Regulation and ask for the assistance of their counterpart authority(ies) of the country where the trader is located. In this connection, the new CPC Regulation, which will be applicable in the EU by the end of 2019, has strengthened the cooperation and surveillance mechanisms of the current system and it will make it possible to exchange information and alerts on infringements across the EU in a more rapid and effective manner. The Commission can facilitate this work and funds may be allocated under the Consumer Programme. (1) i.e. goods marketed in the Single Market under the same brand or trademark but with differences in content, composition or quality in individual EU Member States. (4) Regulation (EU) No 1169/2011 of the European Parliament and of the Council of 25 October 2011 on the provision of food information to consumers, amending Regulations (EC) No 1924/2006 and (EC) No 1925/2006 of the European Parliament and of the Council, and repealing Commission Directive 87/250/EEC, Council Directive 90/496/EEC, Commission Directive 1999/10/EC, Directive 2000/13/EC of the European Parliament and of the Council, Commission Directives 2002/67/EC and 2008/5/EC and Commission Regulation (EC) No 608/2004 (OJ L 304, 22.11.2011, p. 18). (5) Certain products such as chocolate, fruit juices and jam are subject to specific composition requirements or covered by quality schemes, by virtue of EU harmonised or national legislation. (7) Other sector-specific legislation, see for example Chapter IV of Regulation (EU) No 1379/2013 of the European Parliament and of the Council of 11 December 2013 on the common organisation of the markets in fishery and aquaculture products, amending Council Regulations (EC) No 1184/2006 and (EC) No 1224/2009 and repealing Council Regulation (EC) No 104/2000 (OJ L 354, 28.12.2013, p. 1). (8) See in particular p. 17 of the Guidance on the implementation / application of Directive 2005/29/EC on Unfair Commercial Practices (can be retrieved from: http://ec.europa.eu/consumers/consumer_rights/unfair-trade/unfair-practices/index_en.htm). (9) Article 7(5) UCPD and pp. 17-19 of the Guidance on the implementation/application of Directive 2005/29/EC on Unfair Commercial Practices. (10) Articles 7(1) and 7(2) UCPD and p. 69 of the Guidance on the implementation/application of Directive 2005/29/EC on Unfair Commercial Practices. (11) This test determines which information can be considered material or in other words significant for consumers. (12) For certain categories of branded products such as perfumes, luxury goods, cars, people are looking for exactly the same products and fear counterfeits. It can be inferred that a similar behaviour may exist for all kinds of consumer goods. (13) Professional diligence means the standard of special skill and care which a business operator may reasonably be expected to exercise towards consumers, commensurate with honest market practice and/or the general principle of good faith in the business operator’s field of activity. It also includes the observance of quality and control criteria disclosed by the business operator such as quality certification and other certifications. This encompasses principles which were already well-established in the laws of the Member States before the adoption of the UCPD, such as ‘honest market practice’, ‘good faith’ and ‘good market practice’. These principles emphasise normative values that apply in the specific field of business activity. Such normative values should include the respect of applicable sector specific law and their guidance as described in part 1. (14) This is the case for example of canned tuna, whose composition is standardised by Council Regulation (EEC) No 1536/92 of 9 June 1992 laying down common marketing standards for preserved tuna and bonito (OJ L 163, 17.6.1992, p. 1) and Council Regulation (EEC) No 2136/89 of 21 June 1989 laying down common marketing standards for preserved sardines and trade descriptions for preserved sardines and sardine-type products (OJ L 212, 22.7.1989, p. 79). (15) Regulation (EC) No 2006/2004 of the European Parliament and of the Council of 27 October 2004 on cooperation between national authorities responsible for the enforcement of consumer protection laws (the Regulation on consumer protection cooperation) (OJ L 364, 9.12.2004, p. 1).